I've stumbled upon this site looking for some advice and I hope you all can help! My husband and I adopted our chow Amber 4 years ago, she'd been through a couple of homes and we just fell in love with her. 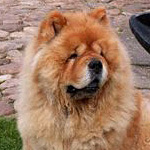 We saw a chow on holiday and we're factinated by the breed after a lot of research we decided to look for one and came across Amber. As she is a rescue we're not really sure how old she is, but given she's recently developed arthritis in her front legs and a love of curling up on the sofa at night we think she's probably around 9. We are due to go and seem him tomorrow but have already been told that he has been with children (we have a 1yr old- who is really good with Amber and just adores her) and that he has been brought up with other dogs. Amber lived with a miniature chow and a collie in her last home and things didn't go too well (the miniature chow was a lot older and thought she was alpha) but since living with us has been socialised very well with other dogs and seems to be fine. Amber is an old girl who likes lying in the garden all day and having the occasional cuddle, I'm wondering if the possibility of a new chow pup is a good idea? I'm well aware that this won't be as straight forward as putting two Labradors together and letting them figure it out! If anyone has any advice or experiences to share I would love to hear them! The young Chow will want to play. If Amber prefers a less active life, then it may require a fair amount of intervention from you. My GSD puppy doesn't understand why my 11.5 year old Chow won't play. He brings her toys and jumps all around her but she doesn't like it. When she has had enough of his antics she puts him in his place. So you may need to be more of the playmate for the young Chow and let Amber get her beauty rest. Thanks so much for sharing your experience- it's good to know there are other people out there that have had the same situation! I suppose I've got a big fear of her being aggressive to the pup- even though she's never shown any sign of aggression, she'll bark at most people that come to the house for a couple of minutes then go back to lying in the garden. I think it's because she was a rescue and while we don't know her background I don't think her life before us was great. Do you have any suggestions on how to introduce them? Typically for a chow Amber is rather territorial! Two is awesome and they can be different as night and day. I got my second while my oldest was three and he still has the energy to play with her. He also is old enough to slam her if he doesn't want to deal. 9 May be too old, especially if she's territorial...he may make her cranky. Then again, it may perk her up if she does indeed like other dogs. My advice, have them meet on neutral ground. If she takes to him, if possible meet a couple more times and then bring him home. I would definitely set boundaries so she still has her own space to retreat from the puppy when she's had enough. There was a slight shuffle in my household until Ty remembered I was boss and it's my house not his; the puppy is now a part of the household and not going anywhere. A few things to think about, but it depends on you to make any situation work. As a Chow owner (and really any dog, but more so with Chows), you must be the leader of your house. You will set the tone and establish the rules. When you add more than one dog, you also have to set a pecking order. It's important that there be no doubt in the dogs mind. You should be the boss and there is no 2nd, 3rd, etc. With an older dog that has been established in the household that can be a hard concept to understand. They will get it, but you can't show favoritism. That's the basic mindset. So, with an older adult dog who places an emphasis on space and quiet time, a puppy is going to infringe on that and push boundaries. It's not a sign of a bad pup, it's just what they do. When in the litter, they compete for time and test each other to find out who is the strongest. It's nature. You are going to have to be paying attention 100% of the time to make sure things don't get too testy. I have owned 2 males together in the past. They were best friends and never had an issue despite being several years apart in age. Currently have a male and a female, they get along, but the female is a bit pushy and sometimes the male wants to be left to himself. You will need to learn the cues. You want to avoid any full on fights. As puppies they learn to yelp when the boundaries are pushed, but as adults this can quickly turn to defense/offense. We actually will be adding a 2nd male soon and will need to watch for competition between the males for as they will vie for her attention (none of my dogs have been altered). My advice would be to think about the additional responsibilities of the 2nd dog. If, after that, you think you can handle it then go ahead. But there is a lot to it. Sounds easy not to favor one over the other, but you have to go into it with the dogs mindset. They must eat at the same time. Which one goes for a walk first? How to spend time brushing out one's fur without the other getting jealous? Do you correct the puppy for playing within normal bounds when the older dog isn't in the mood? Or do you coddle the older dog when she has had enough? If you go ahead, then I would make sure Amber has a safe zone that she can go to without appearing that either is being punished. We have crates set up that are their's and only their's. We have worked to ensure they don't go into each others spaces. It's a respect thing. I have also worked with them so they see themselves as a team. One good response will earn either both a reward, or the other at times. (If Rory sits, sometimes I give Amber the reward, and vice-versa. Other times, they earn it for themselves. Once in a while they both get rewarded for Amber behaving nicely). We rescued our first chow, Loki, ten years ago. A year later we rescued another chow, Frisco. We were asked to take Frisco by our vet as he had been surrendered by his owners and was to be euthanized. 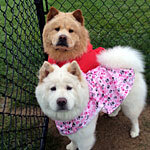 I was reluctant to have two male chows. They met on neutral ground and I agreed to a weekend trial. Well...that was nine years ago and I never looked back. I am devoted to the both of them. Neither is playful...they are both real couch potatoes. Our daughter just rescued a pit bull puppy. She and her husband visited over the holidays with the puppy. I was very nervous to have three male dogs in the house especially when one was two years old and very athletic and playful. The put bull seemed to know his place among the pack and everything went well. They were together for a week and at the end of that time we had a solid pack. They all huddled together in the center of the floor making maneuvering impossible!!!! I missed them when they left and told my husband that, although I am not looking for another dog, if a needy chow came my way I would be reluctant to turn that chow away. Now sure my husband agrees!!! There are many issues with multiple pets, the biggest being medical expense. By the way, both our chows are devoted to our three year old grandson and are gentle and protective. We were able to introduce Shiloh and the GSD puppy in the home via a separated space. We installed a baby gate to keep them separated for the first few weeks. Shiloh is a mellow Chow so that made it easier. Shiloh pretty much tried to avoid the puppy but he continually tried to be her friend. At first it seemed to be a horrible mistake but eventually they got to the point of sharing the same space and nap together. I agree with the other post about maintaining the alpha role. We do let our GSD know when his behavior is not acceptable and to not pester Shiloh. Managing their interaction can try your patience so just be prepared. We want to bring another Chow into our household but it probably won't happen too soon. We want to respect Shiloh's age and make sure she is happy in the time she has with us. Thank you so much for the advice- we're going to see the pup today so I've got a lot to bear in mind! I think the plan (if any of this goes ahead) is to take Amber up to the kennels to meet the pup, then bring him to a park near our home, walk them together and I suppose just bring them back to the house together, take them out to the garden and just see. I know there's not a lot of military precision with my plan but I'm not sure what else I can do as so much hinges on Amber's acceptance. She can be very unpredictable, never in a nasty way but she just seems to short circuit sometimes! If I sneeze she's fine, if my husband sneezes she will get up, walk across the room then lie down again. If anyone else sneezes she goes into full blown panic mode and starts knocking things over, running upstairs to our room and at times jumps in the bath, either turns on the shower or tries to dig through the bottom of the bath. As long as we catch her before this starts and get her out into the garden she usually calms down. We can't have my husbands sister in the house for the same reason, less then a week after we got Amber my husbands sister (allergic to dogs) sneezed in Ambers face and that was the end of it, Amber was trying to jump on the kitchen counter, knocking over lamps and generally creating chaos. To this day she can't come round as Amber really freaks out. We have tried to find someone to assess Amber and see what the issue is but have just been met with shrugs and "Its a Chow"
I'm not really painting her in a very good light, she can be sociable with people (loves men as a rule) and has never shown signs of aggression to anyone. She puts up with my hyper 1yr old and even led down and went to sleep on the feet of the tow truck man that brought my husband home one night. My husbands biggest worry is that she might start showing this manic behaviour because of the pup, she's so unpredictable that she might mother him to bits but we just don't know. The issue will be if she starts behaving like that as we can't cope with it full time. Rory's dad, as Amber loves the garden we were thinking of putting a stair gate on our door between the living room and kitchen (the kitchen leads to the garden) that way if Amber needs a break she can have her space but they can both still see/sniff each other, do you think that would work? TyChowGirl that's a really good point, I'd not thought of that! Just as long as he doesn't start to copy Amber! Yes, I do think the gate situation would work. Generally, giving them some optional space where they can be separate if wanted is a good idea. As for the sneezing issue, it sounds like she is panicky when someone sneezes. It could be the volume startling her, or it could just be that its a strange noise to her. Dogs don't sneeze the same way we do, so she may think that somethings wrong. My own Amber used to be startled and would need to be assured that I was ok after a sneeze. She is used to it now and barely gives a look over. If she's not to skittish in other situations, then its likely just a quirk. A second dog may actually provide her some security and comfort if they get along well. I don't know of anyone that's tried them, but something along the line of a Thunder Shirt may help too. Supposedly they 'hug' the dog and make them feel calmer. Not recommending it, but just a thought. We brought him home last night and so far so good I think. He is really clear abut needing the loo and peed and poo'd in the garden last night. We had 10 minutes of crying when we put him in his crate for the night but then didn't hear a sound until we came down this morning. He had a wee by the back door but that was only because we weren't quick enough- he was clearly trying to tell us. Amber pretty much wants nothing to do with him, he is so excited and runs over to say hello, but when they're both in the house (Amber is outside a lot) I'm tending to keep the lead on him as he's chasing her, she runs away and I don't want it to get to the point where she feels cornered and snaps too badly at him, though I'm aware they're going to have to fight it out at some point, I think he's just a bit too small at the moment. I know we're less than 24hrs in to this, but does anyone have any suggestions about getting Amber a little more amenable to him? As you said, it's less than 24 hours, so I don't think you have a full read on them yet. I would try getting them into the same space under controlled circumstances. Leave Amber to her own devices, but keep Thor on his leash. As long as he minds his manners let him be, but be prepared to step on the leash to control his movement if he invades her space. Do this in short sessions, but don't treat is as a punishment, you are just teaching him boundaries. He is still a puppy and should look to just have some dog-dog companionship in 'calm' times. Perhaps after dinner or after they both have been outside. You can also work to make them reliant on each other. Feed them at the same time, within a short distance of each other, and have them do something before feeding them. I have both of mine sit or lie down. If Thor doesn't have that yet, make it something really easy. Call each by name and have them respond with eye contact. Once BOTH do it, then they can eat. Reward them for going out to do their business, but wait until both have gone. I use a small bit of cheese. Same thing though, make them earn it, and both need to have accomplished something before reward. Alternate tasks so you aren't perceived as showing favoritism. Just wanted to let you know how things are going- Amber has amazed all of us! She spent 2 weeks sulking and not really eating much out of protest, Thor just wanted to be friends so would chase her and nip. Amber doesn't retaliate at all (to the point where I almost wanted her to wallop him to show him who's boss) when a week ago she decided she'd had enough of being beaten up... And it was play time!! I just wanted to thank you all for your advice- everyone we know told us we were being ridiculous and that this was a horrible mistake.